On view throughout the weekend of Photo Independent, Pro’jekt LA Part Five – Connections is a multi media video presented by Visura. 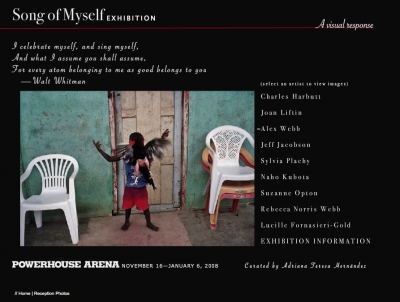 Curated by Scott Thode "Connections" highlights a select group of Visura photographers and how they see the world in a physical, emotional, spiritual and intellectual way. Each story has a unique point of view and is very personal, very real, but can also be very abstract. 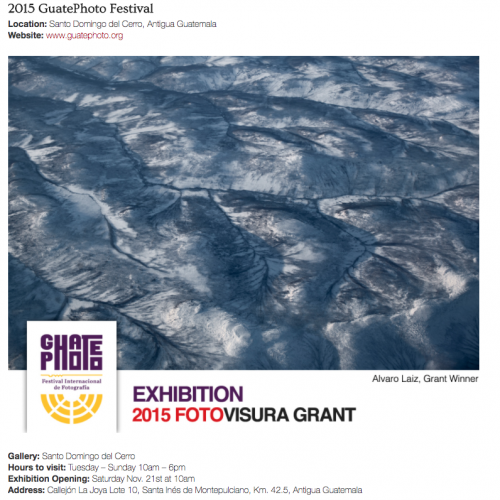 The FotoVisura Grant for Outstanding Personal Project is an annual grant for Visura members with Plus, PRIME and GUILD accounts that aims to support and recognize a photographer for his or her long-term personal project as well as his or her vision. 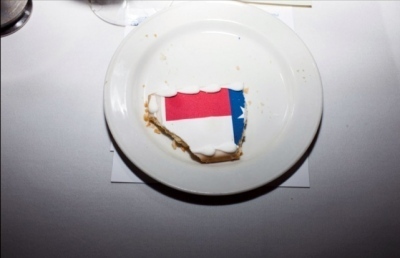 The the judges of the 2016 Grant were: Elizabeth Griffin (Esquire & Hearst Digital Media), Grey Hutton (Vice Magazine), Judy Walgren (San Francisco Chronicle), Lindsay Blatt (Instagram), MaryAnne Golon (The Washington Post), Sebastian Liste (Noor Images) and Simon Barnett (CNN). (2014) SPOTLIGHT Exhibition at Brisbane PowerHouse Gallery in Australia. 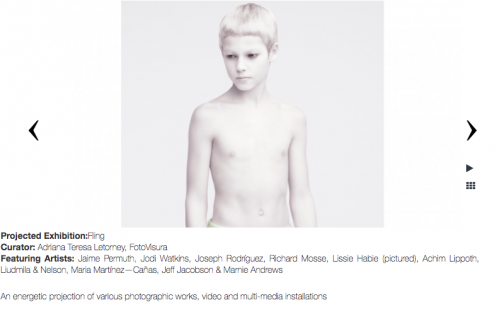 Curated by Adriana Teresa and Graham Letorney, the exhibition presents a selection of individual images by FotoVisura Members recognized by a panel of leading editors and curators in the FotoVisura SPOTLIGHT Grant for Outstanding Student Photography Projects. The SPOTLIGHT exhibition celebrates personal projects by FotoVisura members who are distinguished photography students and alumni seeking to bring about positive change in society. ARTIST TALK: Elle Irvine presents an artist talk about her personal photography project titled, Immeasurable at the Brisbane Powerhouse, Australia on Thursday 15th May, 2014. This Exhibition is Sponsored by The Viso Lizardi Family. (2013) Dialogue & Quiet Conversations (Part II) Exhibition at UPI in New York. Photography, as a mode of communication, has a particular quality of addressing us without speaking down to us. The distance between viewer and subject can be reconciled with the intimacy of studying and inspecting each detail of a photograph. This exhibition seeks to inspire dialogue & quiet conversations with the viewer, transcending cultural and political boundaries. Visura in collaboration with United Photo Industries is delighted to present Dialogue & Quiet Conversations, a gallery exhibition on display at United Photo Industries Gallery. Curated by Sam Barzilay and Graham Letorney—this exhibition consists of 12 individual images selected by a panel of leading curators and editors from the top finalists of the most recent FotoVisura Grant. Erin Trieb, Thomas Michael Alleman, Brad Vest, Anastasia Taylor Lind/VII, Ula Wiznerowicz, Dimitri Mellos, Laura El-Tantawy, Sebastian Liste, Annabel Clark, Marcia Michael, Ivor Prickett, Wendy Marijnissen, Melissa Cacciola, Kai Loeffelbein, Emily Schiffer, Matt Eich/Luceo, Justin Maxon, Elizabeth Herman, Pete Pin, and Amnon Gutman. ‘Save your souls, it’s winter in America’ cried Gil Scott Heron in 1974, against a backdrop of economic decline, social fragmentation, racial tension and a lingering war in Vietnam. Fast forward to contemporary America where the economy is struggling, racism blights many communities and the war in Afghanistan adds a daily toll of misery. 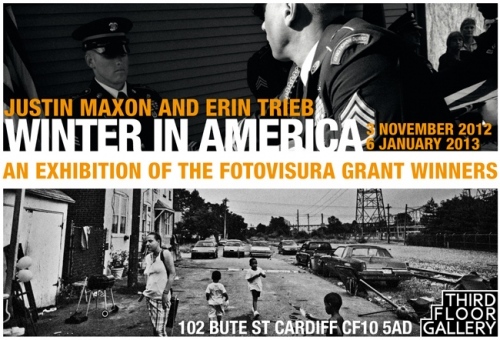 This is the harsh backdrop to the work of Justin Maxon and Erin Trieb, 2010 and 2011 winners of the prestigious Fotovisura grant. Justin Maxon’s work centres on the agonies of life in Chester, a small town of 34,000 people in Pennsylvania, where crime statistics record over 300 unsolved murders since the 1990s. Maxon describes Chester as a hellhole where “violence is commonplace, poverty is oppressive, and jobs are non-existent”. Maxon's images, multiple exposures in grainy monochromes, convey the complexity and inter- connected stories of this small town, unflinching in its depiction of pain and hardship. Erin Trieb’s work follows one soldier, 22 year old Adam Ramsey, on his journey home from Afghanistan, as he battles to recover from post-traumatic stress and depression. Trieb follows his journey from barracks to medical clinic to home in his search for humanity and a return to normality.The opening of this exhibition is supported by Otley Brewing Company and Fotovisura. Enamored is a visual reflection about the force within women which binds our strength with our passion, intelligence with our body and healing power through belief; the internal energy that makes us courageous and victorious, without retaliation. On the contrary, it is a force, inspired by love, that is revealed in our silence. This exhibit addresses the innate inner strength in women, one that unites us worldwide; transcending social, cultural and economical barriers. The fiber of the feminine within. The inner spirit. The energy that crucifies and crowns. The radiance that inspires with love when one is enamored. This photographic exhibition seeks to let this intangible force become tangible, at least for an instant. Maybe this visualization will inspire change. (2010) The IPA Best of Show Exhibition in New York. 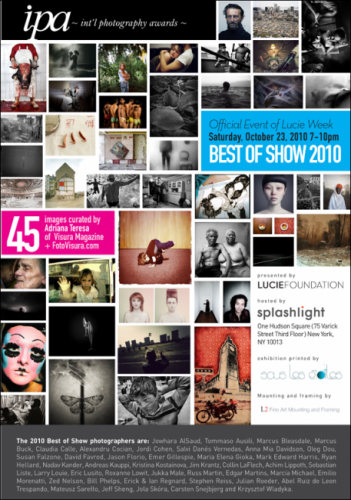 Curator’s Statement: The Best of Show 2010 is a curator’s choice that aims to spark thought, questions, emotions and dialogue. The result is a selection of forty-five individual pieces, many of which are from larger projects, by unique artists worldwide. The selection process was a daunting task as all the artists displayed enormous talent in their work. Still, I had the assignment to edit. Editing is a very personal process, even when working for a specific project. A photograph can serve many purposes, and a curator seeks to unite them: the outcome with the intention, the aesthetic with the content, the format with the artists’ inner voice. This balance is a never-ending challenge. Otherwise, something may be lost, like an intangible aura, which makes the connection between the photograph as an object and the photograph as a voice. Whether through fine art, photojournalism, abstract or any other approach or format—we must seek the aura of an image, it must speak to us. A Pakistani boy displaced from Swat Valley, sleeps under a mosquito net outside his tent at the Jalozai refugee camp near Peshawar, Pakistan; The city of Lagos, Nigeria, a magnet for all of West Africa, largely due to the oil drilling in the country; a uniformed US military service member, who is secretly gay, sits on a bed while covering his face with his hand; a young girl holds a chicken to represent the resurgence of a young generation of sustainable farmers in the Pacific Northwest; a man holding the head of a decapitated bull at a slaughterhouse; a young boy covering his face in the midst of an armed insurgency in Kashmir; a night photograph of a European airport; young wrestlers in India; omitted faces as a sign of censorship in Saudi Arabia; a portrait as a gift to each village Alkalo (chief) in Gambia; a man flying a kite in Japan; a collage that implies that China is taking over the world; Ahlan Ibrahim Abad giving birth to her tenth child in the hospital Al Yarmok, in the midsts of war; Grace, 82, a victim of Alzheimers disease caressing her brother, Joe, her sole caregiver and only sibling living in the US; brick makers working in the urban poor regions of Kathmandu; a Polish man entering the kitchen on a horse during the period of communism; a destroyed monument dedicated to the Soviet Army and the communist rebellion; homeless children playing pool in an abandoned chocolate factory in the city Salvador de Bahia, Brazil; prisoners resting in a jail of the Philippine National Police in Manila; a flower; A Cuban girl posing for a foreigner from the inside of a car. Every curator brings into an exhibition his or her own personal life experience when deciding which image or images strikes them most. The photographer, curator, and audience undergo this process as well. This only implies that there is no right or wrong decision or answer when making a selection, but a difference in experiences that have shaped each individual’s character, interests, visual aesthetics and beliefs. It’s simple, art is a voice; and an image can be art. Featuring work by Charles Harbutt, Joan Liftin, Jeff Jacobson, Naho Kubota, Suzanne Opton, Rebecca Norris Webb, Sylvia Plachy, Alex Webb, and Lucille Fornasieri Gold. Inspired by Walt Whitman’s poem of the same name, Song of Myself presents a vision of our collective existence and the connections between life and death, war and peace, knowledge and ignorance, joy and pain, belief and disbelief. Given the first verse of the poem, artists Charles Harbutt, Joan Liftin, Jeff Jacobson, Naho Kubota, Suzanne Opton, Rebecca Norris Webb, Sylvia Plachy, Alex Webb, and Lucille Fornisieri Gold selected their own works in visual response. Both individually and as a collective, Song of Myself allows us to see our value in this world and to consider the impact of action and inaction as a means to greater consciousness.